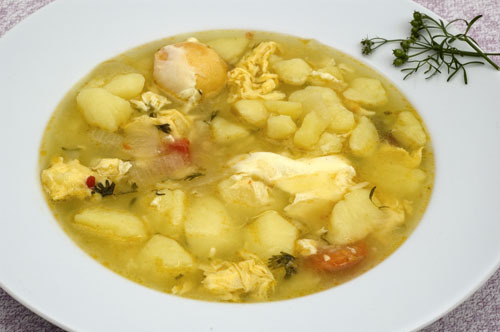 The eggs in this simple potato soup from the Canaries are added in two ways: first, the beaten egg is stirred in, turning the broth opaque, and then whole eggs are added at the last moment with just enough time to allow them to set before the soup is served. 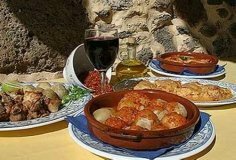 The additions of pimentón and saffron are modern embellishments to this traditional component of a farmer’s midday meal. In a mortar, mash the garlic with about ½ teaspoon of the salt until a paste forms. Set aside. In a large, wide saucepan, combine the potatoes, onion, tomatoes, cilantro, and olive oil and place over medium heat. Using a wooden spoon, stir all the ingredients once or twice to mix well. Add the garlic paste, pimentón, and saffron to the pan, stir to combine, and then add water to cover by 3 inches. Slowly bring to a boil and add the remaining 1 teaspoon salt. 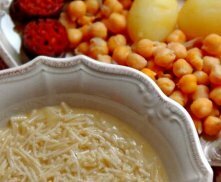 Decrease the heat to medium-low, cover, and cook for 30 minutes, or until the potatoes are fork-tender. Break 1 egg and beat it lightly. Add to the pan and stir quickly for 30 seconds, or until the liquid turns opaque. Working quickly, break the remaining 6 eggs one at a time into a cup and slide each egg into the pan to rest on the surface of the soup. Shake the pan a little and cook for 3 to 5 minutes longer, or until the whites are set and the yolks are still soft. The soup will be a little starchy and thick. Ladle the soup into warmed bowls, including 1 egg with each serving. Serve immediately.